While I think the above is funny, I don't really agree with it. I think it's true that a cat is most loyal to the people who feed it, but there's more to the story than that. I used to think of all cats as arrogant little beasts that did nothing to enhance quality of life. All they did was take-take-take and look cute. But then, over two-and-a-half decades ago, our family acquired a grey-and-white fluffball of a cat whose musical meow caused us to name him Mozart. Mozart proved to be a "people" cat who actively enjoyed hanging around with the family. My brother Sean was able to grab Mozart by his ankles, when swing the cat dramatically onto his neck and shoulders like a living feather boa. The cat submitted to this with nary a complaint, and when he plopped onto Sean's shoulders, his eye* would be half-closed, and he'd be purring loudly. Mozart loved that maneuver. (Caveat: only Sean was ever permitted to handle Mozart that way.) If a cat expresses his love of the family by hunting and killing smaller animals and dropping the carcasses off at the doorstep, then Mozart expressed his love constantly, forever depositing little piles of death that would evoke oohs and aahs from us whenever we saw them. Some of those carcasses were horrifically mangled—I recall, once, seeing a rabbit on our porch that had been thoroughly gutted: everything below the rib cage was missing, but the skin of the rabbit's back was still there, and so were the rabbit's hind legs and tail. I praised the cat all the same: it's terrible when the cat just hates your guts, but praiseworthy when it just ate some guts. I was looking out the window, one fine summer day, when I saw Mozart burst out from under the bushes lining the front of our house, hissing, tail puffed in fury, to chase away a dog that had strayed onto our property: another example of loyalty to the family, and a sure sign that some cats, at least, will protect property. Could Mozart detect drugs or cancer? Could he disarm an armed man without being asked to do so? Learn over 104 voice commands? Probably not. But Mozart, who lived for at least twenty-two years, proved to me that not all cats are selfish, arrogant assholes. He died while I was overseas; I wasn't there the way I was when our dog died. Hilariously, the folks decided to bury the cat right next to the house... and when the house was renovated a couple years later, the new outdoor A/C unit was unwittingly placed right on top of Mozart's little grave. A more distinguished headstone for a cat you'll never find. *Back when he was young, Mozart lost an eye in a fight with another neighborhood cat. When he came back from eye-removal surgery (his eye had been deeply slashed, with vitreous humor leaking out, making him look a lot like the Terminator), Mozart's head was half-shaven, and he was wearing one of those ridiculous plastic Radar Collars of Shame to prevent him from scratching at his stitches. He had to relearn all the basics, from feeding himself while wearing the collar to navigating the house's indoor staircase without any depth perception. Eventually, the stitches were removed and the collar came off, and we discovered that Mozart loved it when one of us guys would stick a finger into his empty eye socket and rotate the fingertip to give him a scratch. Mom refused to scratch Mozart this way; she thought it was a disgusting act. Whenever I gave the cat a socket-scratch, I could feel the twitching of certain still-extant muscles inside the socket as the cat purred his satisfaction. Speaking of disgusting: I also discovered that Mozart loved chewing on used Q-tips. The scent (and flavor?) of human earwax drove him nuts. If scientists had developed earwax-flavored cat food while Mozart was alive, he'd have eaten it by the bagful. Again, my mother was revolted every time she saw me take a Q-tip out of my ear and hand it to the cat. The cat, purring, would flop onto his back and gently gnaw at his prize. I think my mother's disgust extended to both of us: she was revolted that I would ever feed the cat my earwax, and she thought the cat—a supposedly dignified animal—was equally nasty for actually liking the earwax. Wait... dogs can detect cancer in humans? So... they're like the zombies in World War Z? 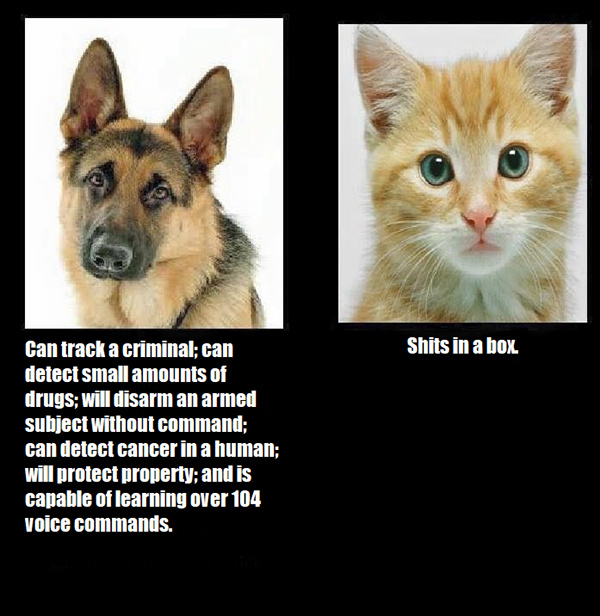 Yeah, the cancer-sniffing dog notion has been around for some time, although it may or may not be valid. And a few years back, there was the whole "cat sensing impending death" thing, in which cats that were somehow cleared to be in a nursing home would curl up with residents who, as it turned out, were on the cusp of dying (see here).